The boy laid down to rest near the very back of the lean-to, gathering some leaves the two adult women had somehow strung together to act as a covering for sleep. There was no warmth in laying under the leaves, however, certainly nothing like luxuriating under a bear skin or a cover made from other furred animals. The boy thought about how trading worked in his old tribe. Hunters from other tribes located much further upriver from the tribe would visit during the late morning or early afternoon hours. They’d lay down some animal skin and then put what they wanted to trade on its clean surface. Then they would sit and wait for any interested tribal member to come by, bringing something to trade. There was little talk, as the dialects of differing languages spoken among the many tribes were distinctly different and there was no one to translate. The wind was picking up as the late afternoon was turning into night. Aurora and Night Moon had both fires burning, although one would be extinguished before the full darkness of night came on. The boy breathed deeply in and out, finally realizing that the blanket he’d covered himself wasn’t made from leaves at all. It had to be beaten Yucca, as the aroma emanating out of it was a sweet carroty smell. The Yucca plants had been those most used by his tribe for making everything from rope to clothing, and even substituting for soap when none of that rare product was available through trading. The boy slid out from under the makeshift blanket and crawled out of the lean to. “Light,” Aurora said, her voice accusing but not in an unfriendly way. “Work in light, sleep in dark,” she went on, before ducking away to perform some other womanly function. The boy shook his head, wondering what work he was supposed to be doing. He joined Cetan, who was busy at putting together poles that had been scraped clean of their bark, as if the nearby beaver had been called to work, as well. “Yes, the obsidian,” the boy said, crouching down to watch Cetan tie the ends of the poles together one by one. “Why has it been there for so long but nobody has found it before?” he asked. The older warrior worked away at getting the small holes cut into the skin so it could be mounted and stretched across the open space between the poles. He didn’t reply to the question. “That’s good,” Cetan said, smiling as he worked. “Unless you or I are inside when the cave closes up,” Tama said, keeping his voice low. Aurora and Night Moon were perfectly capable of giving their opinions about anything and everything. They needed the obsidian for trade, but they also needed to keep the location a secret or it would soon belong to one or both of the larger tribes preparing to winter in the valley close by. The boy was surprised. Cetan had never put as many words together before in one sitting. The older warrior had been thinking about the problem since they’d found the obsidian. “What are we to do?” the boy asked. He was the only one between them that would be crossing the water and entering the cave complex. The thought of being roasted over a slow fire by either tribe to get the secret of the material’s location out of him was discomforting. He knew that the tribal warriors would be sorry to roast him, but for their survival, and the good of the tribe, they certainly would if given the opportunity. The boy thought about what the older warrior was telling him. There was only one of them that would be making the trips with the heavy stones, and it wasn’t going to be Cetan. How many trips could he make carrying a heavy pack without slipping and going over the falls? The boy moved toward the beaver, Sipu. The animal looked at his approach but didn’t move from its position near the opening to the cleft where the cat lay sleeping. The cat seemed to take no notice of his approach at all. “What part do you have in all this?” the boy said, leaning over to look deeply into animal’s dark brown eyes. 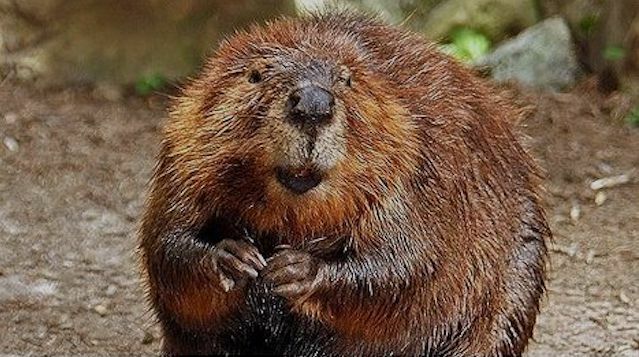 The beaver blinked. The boy blinked back. He was becoming used to the strange blinking communication the cat had first used on him when he’d encountered it days before. The only problem was that the boy had no idea what was being communicated except it was obvious that the signal was one of quiet acceptance of his presence. He sat down to watch Cetan finish his work by the fire, the children to continue stabbing one another with their play spears and the women working around the fire. There was little question what the dinner fare would be. Cetan had butchered the deer and great steaks of it lay glistening next to the cooking fire. Later the warrior would tie the remaining meat into one mass to suspend it high under an overhanging tree branch a distance from the campsite to keep it safe from predators. The boy watched the operation but said little until it was done. “You know, I think the cat can jump higher than that,” he noted, as they walked back to the camp together. The boy shivered at the thought of one of the larger foraging bears that crossed through the area from time to time. A good number of seasoned warriors would easily drive one off or kill it, but there were only Cetan and himself, plus the cat, but could that animal be counted on to fight a bear on all of their behalfs, or even take part in such combat? The boy looked at the cat. It was a beautiful animal seen so close up. He wondered if such living cats, like Hasti, the one that had taken them in, were ever viewed close up by humans, and the animal dead would never have the presence and character of the one they now lived in some mysterious and not fully understandable relation with. The night came and so did the meal. Aurora and Night Moon were great cooks when handed such fresh and plentiful meat. The cat ate three huge steaks and returned to its cleft to sleep again. The boy ate until he was tired of eating and his belly seemed swollen to the point of bursting. Eating fresh fish was good but eating the cooked deer meat was far beyond that. They all slept through the night, the boy waking to the sounds of Aurora stoking the coals to make a fire for the coming day. The cat was gone, the beaver had disappeared and Cetan was nowhere to be seen. The boy asked Aurora where the warrior had gone. The woman didn’t respond orally, merely pointing with one finger toward the area upriver from where they were. The boy grabbed his large hunting spear and headed upriver at a lope, wondering why Cetan had not awakened him. It didn’t take long before he came upon the squatting warrior, working with a pile of long stalk-like leaves. He settled in, between the limited space between Cetan and the nearby river. The bank, where the older warrior had chosen to work consisted of hardened riverbank mud. The boy noted that there were two piles; the larger one of loose leaves and a smaller one made up of the braided rope the warrior was producing by intertwining those leaves. “It’ll work, but we need the women,” Cetan said. “What?” the boy answered, mystified by the warrior’s comment, as well as the nearly hypnotic effect of the warriors rapidly moving fingers. At that, he stopped working, came to his feet and moved to the cold roiling river water to bend down and soak his hands. The boy began to see the water out in front of him differently. He’d never been afraid of the water, not even the deadly rushing river water near the falls. He’d learned to stay on top of the surface from his mother at an early age, and always much liked the fact that if you dived down deep in the water the cold pure stuff at the bottom was the best of all to slake a thirst, but he’d never looked upon the substance as being a force to do work. “Will someone see where the raft is on the shore?” the boy asked, trying to think the whole operation through like he knew Cetan was. The boy wondered if it could all be done so simply, although he knew being alone on the other side would be difficult. He loved working closely with the older warrior. Everything seemed to go so much easier and more successfully than it ever had when he was on his own. The cat lay only a few man-lengths from where the boy and Cetan worked. When the older warrior headed back to the encampment to get the women, he silently moved from under a nearby pine to sit just behind and next to the boy. He stared out across the water, like the boy did, but without any comprehension for why such attention to the river was called for. There was no enemy or prey visible across the span of noisy moving water. The boy turned and yelled out loud, causing the cat to rock back and rotate his ears before recovering. “What are you doing?” the boy breathed out as if the cat was capable of answering him. The cat decided to ignore the boy and his fearful reaction. Instead of departing the area, however, he decided to slink down into a more relaxed position, his long body flat but head and shoulders upraised. He wasn’t sure why he remained around the humans, except the association with them made him feel strangely warm inside. The humans were also so fragile without seeming to understand how fragile they were. The cat looked back at the encampment, wondering when the children would eventually be around to try to poke or torture him in some other fashion. The children were particularly at risk in the forest, although the bigger humans didn’t seem to understand or react to that. Cetan returned, with Aurora, Night Moon and both children following behind. The women were quiet, but the children were their usual noisy selves. The cat looked back at all five humans but made no move to leave, returning his attention to the river. “Is that thing going to stay here?” Aurora asked, stopping not far from where the cat lays, to point at it. The boy didn’t know what to say, looking over and meeting the cat’s unexpressive gaze. Somehow, he knew the cat wasn’t a threat to any of them, but he didn’t understand why he felt that way. He knew it had to be more than the fact that the cat had come to enjoy having a dependable supply of cooked fish and meat. Predatory animals were not known to change their predatory habits, but something had happened with the cat. “We need the rope,” Cetan instructed the women, as they knelt to go to work. “And we need to gather more of the leaves,” he said to the boy, before looking past him to the cat. The children were gingerly tossing small pebbles at Hasti’s body but the animal ignored them and the pebbles like there weren’t even there. Finally, he put his big head down and closed his eyes. “This is all wrong,” Aurora breathed out, but then looked into Cetan’s fierce eyes and went back to work. Sure are keeping our interest perked up, James! One correction: “It didn’t take long before he came upon the squatting warrior, working with a pile of long stalk-like leaves. He settled in, between the limited space between Cetan and the nearby river.” Maybe, “He settled into the limited space…..”? and even with that the last time I saw a report of such a thing was when I was a kid. don’t attack because they might get hurt in the process. Thanks for feeding my need with another great chapter. Thanks again, Pete for all of your continued support and sharp eyes. James, Thank you for another installment. It feeds my big cat fantasy. Remember to share with friends. “Is that thing going to stay here?” Aurora asked, stopping not from where the cat lays to point at it. Thanks so much for the help Roy!